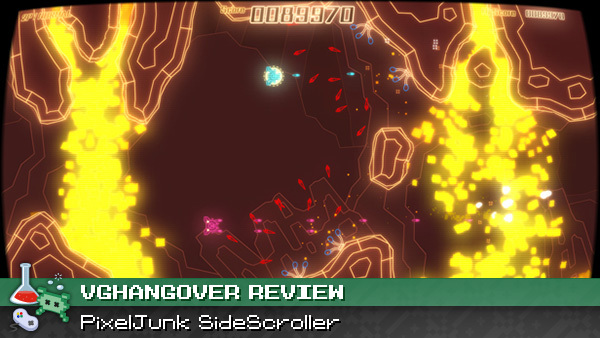 PixelJunk SideScroller review: Shoot the core? When Q-Games announced in 2009 that their new PixelJunk title would be called PixelJunk Shooter, despite it playing more like Solar Jetman than Gradius, the 2D shooter fan in me cringed a little. Fast forward a couple years and Q-Games has spun elements from that game into a new title that plays more like a traditional shooter but, in a small twist of irony, is called PixelJunk SideScroller to set it apart from its less shootery siblings. Although the visuals make a bold statement, the gameplay remains more on the safe side for a shooter. Your ship travels from left to right and you shoot enemies with three main weapons: a rapid-fire machinegun, a narrow laser beam that pierces targets, and upward- and downward-firing bombs that help take out heavily armored turrets you’ll find throughout each sector. You start with all three weapons and can switch between them at any time, so it’s up to you to choose the best one for your current situation. You can also pick up a shield and several levels of upgrades for each weapon, and a chargeable spin attack launches the ship itself into enemies. 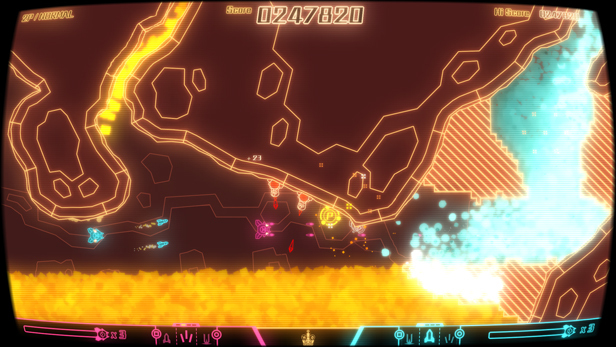 Borrowing from Shooter, getting shot will cause your ship to overheat and you’ll have a few moments before it explodes to find some restorative water or health powerups. That’s a solid foundation, but SideScroller suffers from awkward controls that make it frustrating to play. When I first started the game, I instinctively went to the D-pad and face buttons for movement and shooting, only to learn that the game uses R1 to shoot and reserves the face buttons (or LR/R2) for cycling through weapons. What took longer to realize is that it also expects players to use the left stick to move; the ship feels very slippery with the D-pad and the analog stick offers a welcome amount of precision–although the controls still aren’t as tight as you might hope for in a shooter. As a result, it can be difficult to land precision shots with the laser, and it’s hard to weave through the aforementioned waves of bullets with much confidence. I found it was a better bet to just find a safe area on the screen. The weapon select system never became intuitive either, even after hours of playing the game. The biggest problem is you have to cycle through each weapon linearly, and while that means your desired weapon is one button press away in theory, during an intense firefight, you’ll often end up cycling the wrong direction and firing something that’s dramatically different than what you expected. These sound like minor details, but just for example: Far too many times I would end up wanting to switch to the laser to take out a line of enemies flying straight towards me, but I’d accidentally switch to bombs and find myself shooting at the ground as the enemies crashed into my ship. This could easily be fixed by an onscreen weapon indicator or just having the face buttons switch to a weapon directly. Hopefully Q-Games can address this in a patch, because when you’re trying to make split-second decisions on how to best take out a group of enemies, the last thing you need to be doing is trying to remember which weapon is up next. If you don’t want to worry as much about the controls or just the general difficulty (which is probably too high for an easily frustrated player), you can turn the game down to Casual–where enemies move slower and shoot fewer bullets–and enjoy some light shooting action while taking in the rest of the game. Sadly, aside from the wonderful retro aesthetic, SideScroller doesn’t have much else to offer. While each new area in Shooter introduced more gameplay elements, the strategy in SideScroller remains the same throughout (Shoot everything! 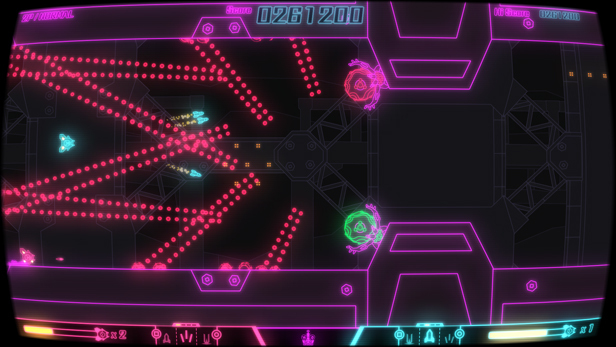 ), and after a while the sectors blur together into a homogeneous, neon haze. The electronica duo, High Frequency Bandwidth, returns to compose the soundtrack, although it’s not as memorable as the work they did for Shooter 1 or 2. There are online leaderboards to conquer and hidden crowns to collect, but after trudging through each sector, going back and replaying them for a few collectibles feels like a chore. Ultimately, while I was curious to see Q-Games’ take on the shooter genre–especially after they teased everyone with a brief, sidescrolling segment as a bonus stage in Shooter 2—PixelJunk SideScroller ends up coming off as a clunky proof of concept, which is unexpected for a series which has given us some of the most offbeat and memorable games this generation. Strangely enough, an earlier version of the game does seem to have a weapon indicator (along with a more prominent health bar), as shown in the article screenshots. Bonus Feature: Gameplay video recording and YouTube uploading. The quality isn’t fantastic and it disables custom soundtracks (Also, the game has custom soundtracks. ), but it’s good to see more games including this feature. PixelJunk SideScroller was provided for review by Sony. Completed all sectors (including the Last Stage) on Normal. Replayed sector 1 on Hard, and again on Casual to pretend I work for a major outlet. For more info on how VGH approaches game reviews, please read our reviews philosophy. Sounds like you’re not a good gamer.